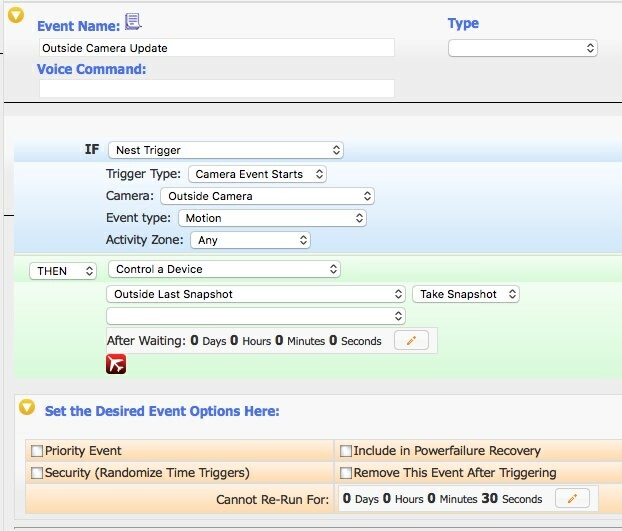 Nest cam Snapshot event how..
Is there a way to make an event to refresh nest cam snapshot every minute or more...? What do you mean House cleaning...? and can you help me with how do you set the event for the snapshot...? Create a new event and set it at a reoccurring event every 1 minute. As for house cleaning... inside the html/images/nest folder if memory serves correct it will create a folder called snapshots and keep adding to it and you will need to keep that clean as the plugin cannot do it for you. Great thanks, I will try it. On a whim, here's what I did for one of my cameras. It requires setting up Activity Zone(s) within Nest, but I figure it reduces the number of snapshots, while still making changes when necessary (but not too many, hence the 30 second timeout).